The Notre Dame London Law Program was born 50 years ago, in the fall of 1968, with the idea that law students would become better lawyers if their legal education provided them with a global perspective. Over the past half-century, more than 1,500 students from Notre Dame Law School have studied in the London Law Program for a semester or a full academic year. 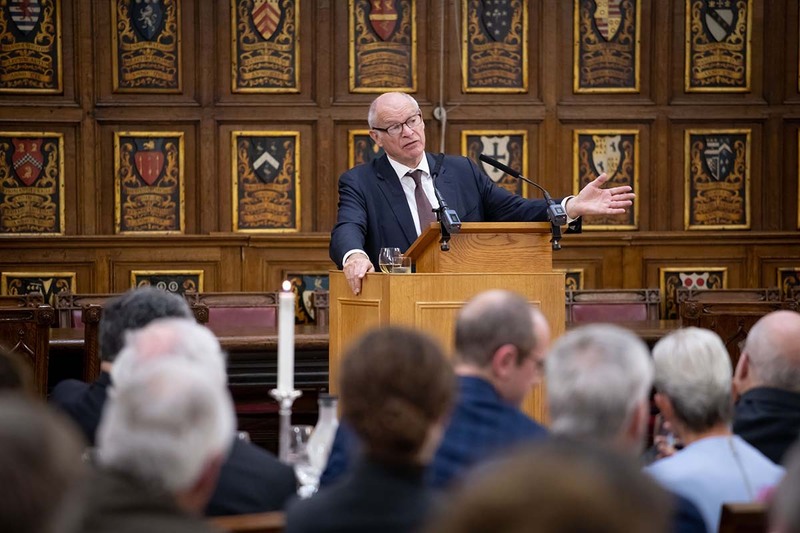 Lord David E. Neuberger, former president of the Supreme Court of the United Kingdom, affirmed the idea behind the London Law Program on Sunday evening when he delivered the keynote address at a dinner celebrating the program’s 50th anniversary. “The idea of giving law students a proper understanding of other countries by coming here, and other jurisdictions by studying around the world, is a very noble one,” Neuberger said. The Lord Neuberger of Abbotsbury, former president of the Supreme Court of the United Kingdom, gives the keynote address at the Law School London Golden Jubilee celebration at Middle Temple Hall in London. The Notre Dame London Law Program was a unique experiment in American legal education when the Law School started it. Today, it is the oldest study-abroad program offered by an American law school and the only full-year London program approved by the American Bar Association. The Law School and Notre Dame International have been celebrating the London Law Program’s 50th anniversary throughout 2018 with speakers and events at Notre Dame’s London Global Gateway near Trafalgar Square. 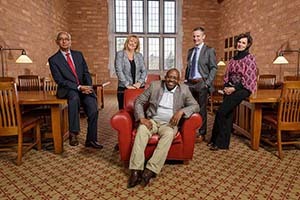 The culminating celebration, a Golden Jubilee, started Saturday and continues through Tuesday in London with events for alumni, students and faculty of the program. 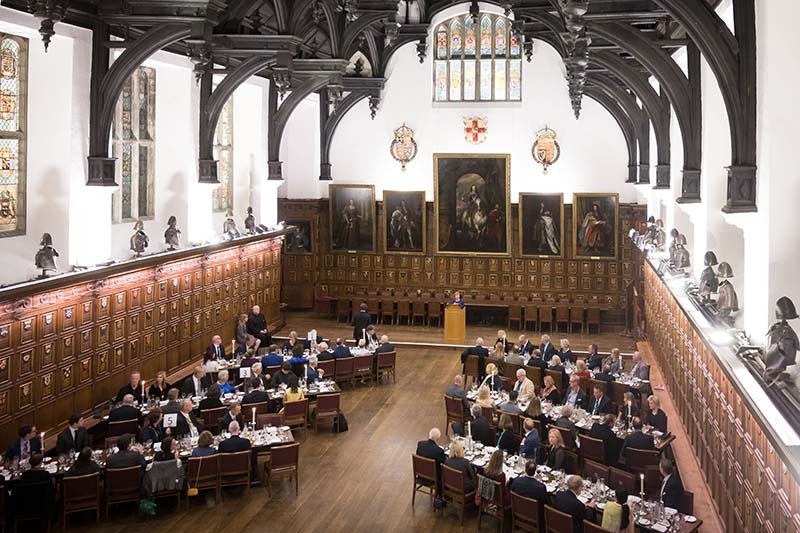 The dinner on Sunday was held at Middle Temple — an exclusive Inn of Court with numerous connections to the United States. For instance, five of the men who signed the Declaration of Independence were members of Middle Temple. Rev. 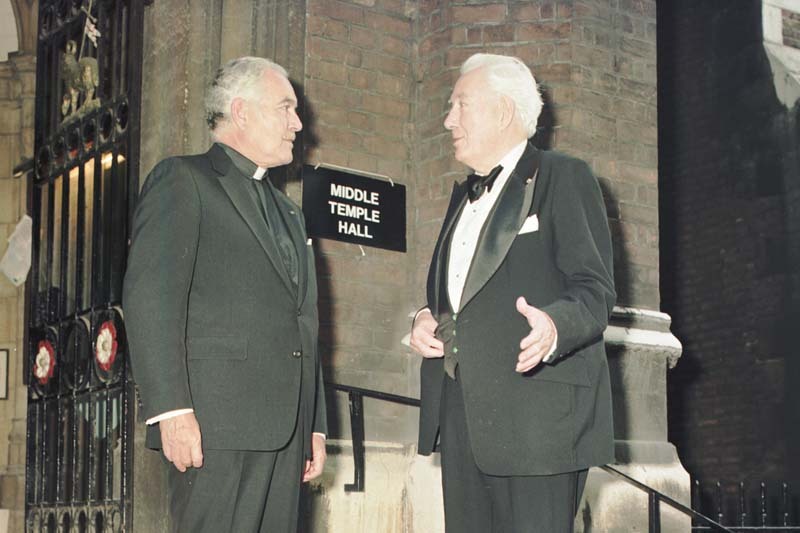 Theodore M. Hesburgh, C.S.C., talking with Chief Justice Warren E. Burger of the U.S. Supreme Court outside Middle Temple in 1983, when Notre Dame dedicated the London Law Centre. Notre Dame Law School Dean Nell Newton gives welcoming remarks at the Law School London Golden Jubilee celebration at Middle Temple Hall in London. Lord Neuberger noted at the end of his speech that Sunday’s ceremony was happening in the same venue where Notre Dame celebrated that previous milestone for the London Law Program. He concluded his remarks by asking everyone to raise their glasses in a toast to the memory and legacy of the late Father Hesburgh, who was a champion for international cooperation, peace and human rights during his years as Notre Dame’s president. In many respects, the London Law Program’s relevance has only grown over the decades as globalization has resulted in a world where people have more and more connections that transcend borders. 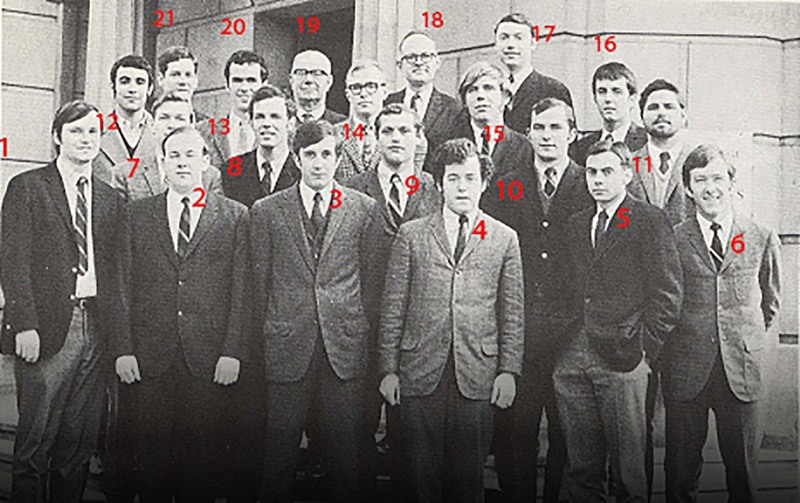 The first class of Notre Dame Law students who studied in London for the 1968-69 academic year. Students who study in London have opportunities to learn inside and outside the classroom while participating in the program. They can take study trips to British courts and visit international organizations in Brussels and Geneva. They can also learn about the practice of law through externships in which they work under the supervision of British barristers and solicitors. 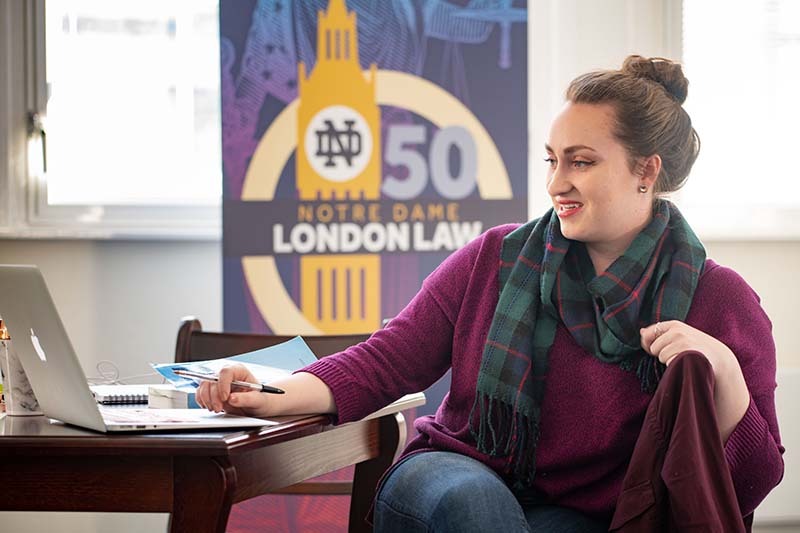 The London Law Program was the reason that Kimberly Schreiber, a member of Notre Dame Law School’s Class of 2020, chose to attend Notre Dame for law school. In addition to the opportunity to study American law at its roots in England, to experience London’s culture and to learn about British and European legal practice through study trips and externships, she said, it has also been fulfilling to learn from the program’s diverse professors. 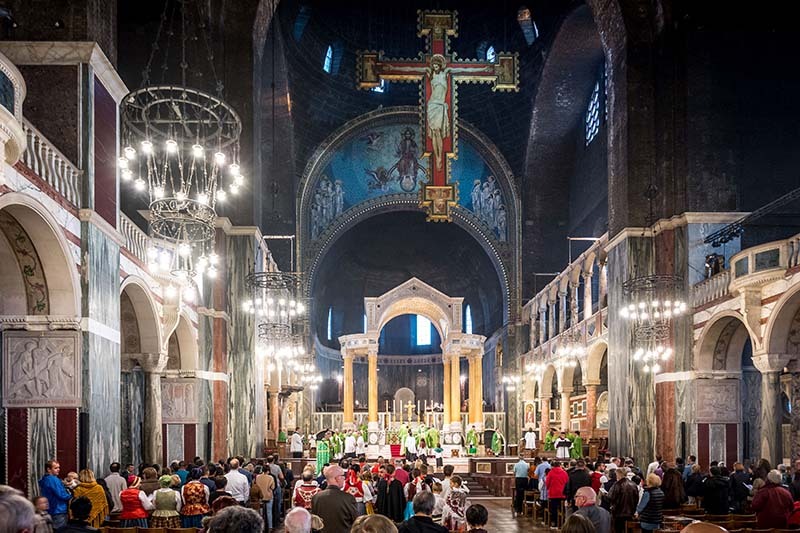 During Mass at Westminster Cathedral in London, principal celebrant The Right Rev. Paul McAleenan, Auxiliary Bishop of Westminster, welcomed the participants in the Notre Dame Law School London Golden Jubilee. Rev. Jim Lies, C.S.C., concelebrated the Mass. Notre Dame Law School student Kimberly Schreiber works in the Piccadilly room of Fischer Hall, the London Global Gateway. “We’ve had a couple of American professors, a couple of Greek professors, in addition to English professors. Most of them are professors elsewhere or they’re attorneys elsewhere, and they have very different experiences. They have a totally different view on the law and how the law works,” Schreiber said. Students who participate in the London Law Program will frequently describe it as a life-changing experience. Chris McLemore ’07 J.D. is one of those graduates whose life was altered by participating in the London Law Program. 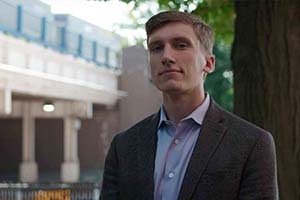 Both he and his wife, Jaime McLemore ’07 J.D., were students in the London Law Program for the 2005-06 academic year and have practiced law in London since graduating from the Law School. “When I came to study in London, when the airplane wheels touched down in London, it was the first time I’d ever been out of the United States aside from one day to see a baseball game in Toronto. When we left again and the wheels picked up to go back to South Bend, I knew that I had to come back,” he said. McLemore said the London Law Program provided two key things for him and his wife. First, it helped them understand that they could live in London, not just on a study-abroad basis but on a professional basis. And second, it provided them with professional connections that were important when looking for jobs to return to London.